At the top of the page, there are now 19 quick links that will take you to that location within these 15 pages of text. See image below. Beginning with items #2 and #3, we added shading to make these tables easier to read. 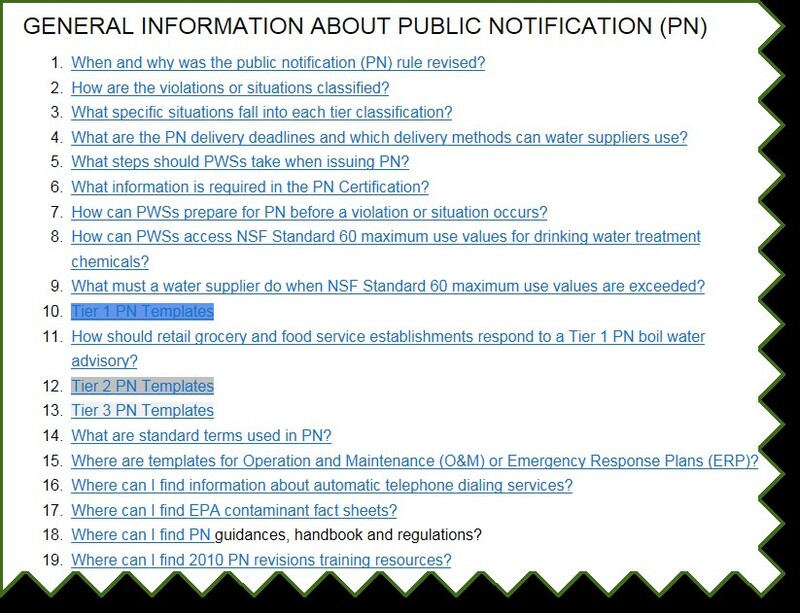 Within the 19 quick links and throughout these pages, Tier 1 information is shaded in blue, Tier 2 information is shaded in dark gray and Tier 3 information is shaded in light gray. However, Tier 1 and Tier 2 template tables (item #10 and #12) use a standard table format that alternates a colored row with a light gray row. Each of the 19 sections contain a small link in the upper right corner that takes you to the top of the page. Additionally, under the 3 PN template tables (#10, #12, and #13) you can also click on Tier 1, Tier 2, or Tier 3 to move from one PN template table to another PN template table. The PN templates are listed in alphabetical order and now have the correct form number for each template. Feel free to share this email with anyone who is interested in the PN website.